The Ashy-faced Owl is similar in size and appearance to the North American Barn Owl, but overall darker, grayer, and with a distinctly ashy-gray facial disk. It was once thought to be a subspecies of the Barn Owl, but is now recognized as a separate species endemic to the island of Hispaniola (Haiti and the Dominican Republic). Data on the species is still somewhat limited, but it is thought to favour open woodlands, forests, and scrub, including areas around towns and villages. Ashy-faced Owls prey primarily on small mammals and birds, but also hunt tree frogs and lizards. The population of these owls is declining, largely due to habitat loss, which in turn is a consequence of the rapid growth of the Dominican Republic's human population from less than 2.5 million in 1950 to over 8 million just half a century later. The Ashy-faced Owl is more dependant on forests than the somewhat larger Barn Owl; as a result, deforestation has benefited the Barn Owl at the expense of the Ashy-faced Owl. The Ashy-faced Owl was first bred in captivity in Germany about ten years ago. In 1997 the Dominican National Zoo (ZOODOM) and the Society for the Conservation and Research of Owls (S.C.R.O.) signed an agreement to cooperate on a breeding project for the conservation of this species in the Dominican Republic. 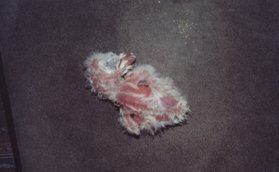 In March 2001, two chicks were hatched in captivity for the first time in the Americas, and seven additional chicks have hatched since. Website describing the conservation efforts aimed at the owls of the Dominican Republic, including the ashy-faced, with information about captive breeding efforts, habitat issues, and more. 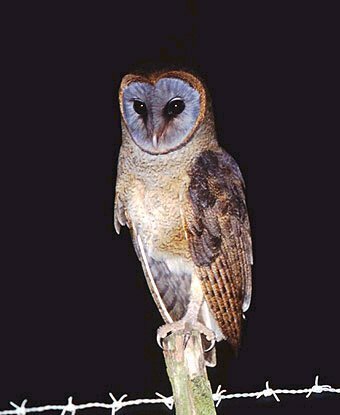 Detailed description of the species, accompanied by photos and information about the conservation status of the ashy-faced owl.